It is popularly thought that pottery vessels deposited in graves represented meals for the deceased, but this has been little tested statistically using 'big data'. By way of redress, this article brings together pottery data from a number of large cemeteries in south-east Roman Britain, as well as from selected sites on the European Continent, and compares them with pottery data from settlement assemblages associated by location, status and date. 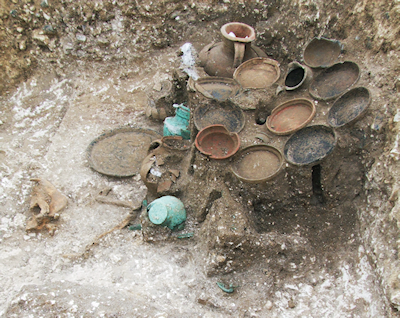 The analysis suggests that grave groups did not represent table settings used in life, except for those in cemeteries associated with higher status settlements. Cemetery assemblages associated with lower status settlements are fundamentally different from the settlements' domestic assemblages; vessel classes well represented in graves do not have a significant presence in the non-funerary assemblages from related settlements. In contrast, graves containing suites of vessels that, it could be argued, represent full table settings were well represented at urban cemeteries, but less well represented in cemeteries associated with lower status settlements. Thus, mourners selecting and depositing pottery in graves at urban centres may well have seen the same sort of pottery on their dining tables on a regular basis. In contrast, mourners at rural settlements may have seen the pottery deposited as grave goods only at funerals. In addition, evidence from one cemetery, Pepper Hill in Kent, points to the possibility that beliefs associated with burial rites, rather than, necessarily, the desire to mirror pottery usage in life, was a factor in determining the selection of vessels for the grave.